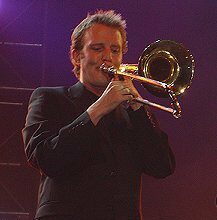 Jordan moved to Melbourne in 1996 after graduating from the Western Australian Conservatorium of Music, and completing further studies at Berklee College of Music, Boston. While in the United States Jordan studied trombone with Hal Crook, Phil Wilson and composition and arrangement with Herb Pomeroy. Study in the USA gave Jordan the opportunity to perform with artists such as Aretha Franklin, Dennis Chambers and Bill Pierce. Jordan has also performed at various jazz festivals around the world such as India's Jazz Yatra, New York's JVC Jazz Festival and last year in New Orleans as part of the IAJE conference. Jordan has also performed with many leading Australian artists such as Renee Geyer, Tommy Emmanuel, Ross Wilson, Christine Anu, James Morrison and Dale Barlow. Albums: John Farnham & Tom Jones Together In Concert. Concerts: John Farnham & Tom Jones Together In Concert.